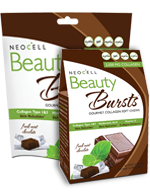 A couple of days ago I shared Neocell's Beauty Bursts with all of you. Today I have some awesome news. The generous people over at Neocell are allowing me to give one of you lucky ladies the chance to win some Beauty Bursts of your own. As a thank you be sure to like Neocell on Facebook for all the latest news and to stay up to date on any new great products. To Enter: Visit Neocell and tell me another one of their products you would like to try. You can get extra entries for following GGG through GFC, Subscribing via email, liking us on Facebook and following via Twitter. This giveaway will end on August 17, 2016. I will choose the winner using Random.org. Please leave a valid email address if it is not visible in your profile. US entries only. I am interested in the Fish Collagen Youth Boost. I follow as Maryann D.
I would love to try the BIOTIN BURSTS SOFT CHEWS - ACAI BERRY.